Long-Awaited Romantic Interlude Turns Deadly…. At long last Alex has returned to Wyndley Farm, her childhood home, with her infant child and the love of her life, undercover operative Jacob Stark. Her happiness is short-lived and abruptly ends as CIA agent Digger Stildove gathers intel that suggests trouble from the other side of the globe. Digger and Jacob leave Virginia for the Middle-East but danger escalates quickly as the Secret Service detects imminent terrorist activity near the farm. Get This Thriller Book From Amazon. Dr. Judith Lucci is an Amazon bestselling author who writes what she knows. She is the author of the Alex Destephano Medical Thriller Series set in New Orleans and the newly released Michaela McPherson mystery series set in her home town of Richmond, Virginia. The new Richmond series focuses on newly retired homicide detective Michaela McPherson,her 82 year old aristocratic side kick, The Countess Dorothy Borghese, and Mic’s rescue police dog, Angel. Mic, Dottie and Angel solve crimes of epic dimension. Recently, The Case of Dr. Dude, the first Michaela McPherson won ‘Best Read of the Summer’ an award presented by Lock Publishing in the United Kingdom. A second Michaela McPherson mystery, The Dead Dowager releases in early December of 2016. Judith also has a collection of short stories, Black Magic Bayou, best described as ‘moralistic tales’ that use Cajun and Creole lore and legend as their basis. A novella, Beach Blanket Murders: The Ocean Can Be Deadly is due out June 1 and is set on the Outer Banks of North Carolina. She’s also contributed to three anthologies and author collections. “Before I wrote fiction, I was an academic writer who published research, theoretical works, authored text books and just about anything a college professor needed to publish to survive.” The differences in academic and fiction writing are dramatic. Writing what I know encourages me to pull from my clinical experiences, some good, some not and use popular fiction as a means to teach and advocate for others. 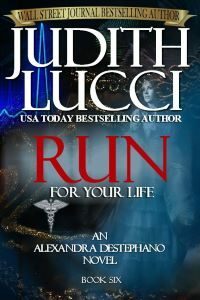 Dr. Lucci’s books have three purposes, to engage the reader, to entertain them and to educate about healthcare and perhaps, the darker side of hospital life and life in general. Her books are described as contemporary novels that focus on and describe current social, moral and ethical issues in present day society. Judith is a true advocate for social justice and ethical reasoning and that theme is often prevalent in her work. Dr. Lucci is a nurse who holds graduate and doctoral degrees from Virginia Commonwealth University and the University of Virginia. She’s an avid reader and loves making stuff up and writing it down. She’s a member of the Virginia Writers Club, The Gulf Coast Writers Club, The Shenandoah Valley Writers group and Sisters in Crime. “When I’m not writing I’m probably creating or teaching art, painting on silk, oil or watercolor. Please feel free to contact me at judithlucciwrites@gmail.com. I am excited about meeting you!